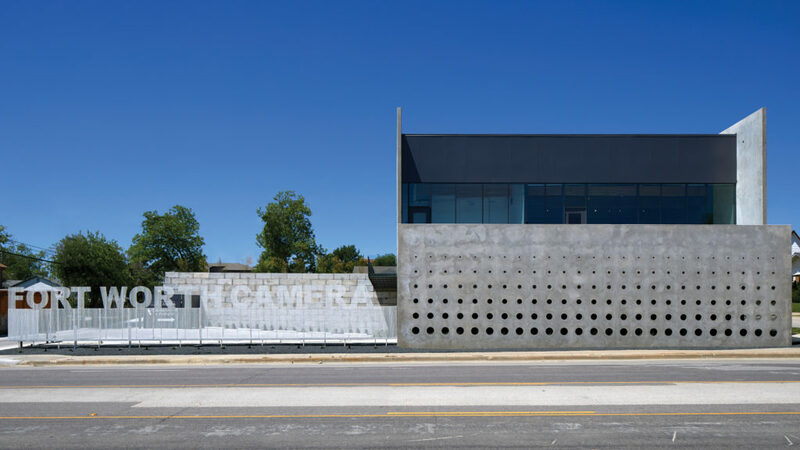 Fort Worth Camera, designed by Ibañez Shaw Architecture and built by Tim Pulliam of Concrete Work L.P., sits on Montgomery Street, a commercial corridor that lies between the Arlington Heights neighborhood and the Museum/Cultural District in Fort Worth, Texas. The Museum of Science and History by Legoretta +Legoretta is directly across the street. 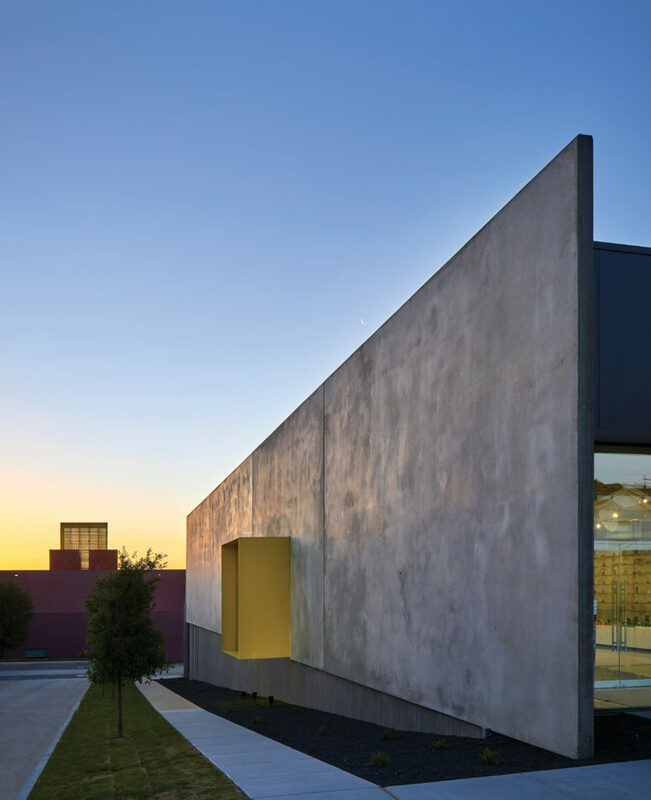 The District is also home to Tadao Ando’s wonderful concrete Modern Art Museum of Fort Worth, and the masterwork Kimball Art Museum, designed by Louis Kahn. The Fort Worth Camera building houses photography classrooms, studios, and a retail area. 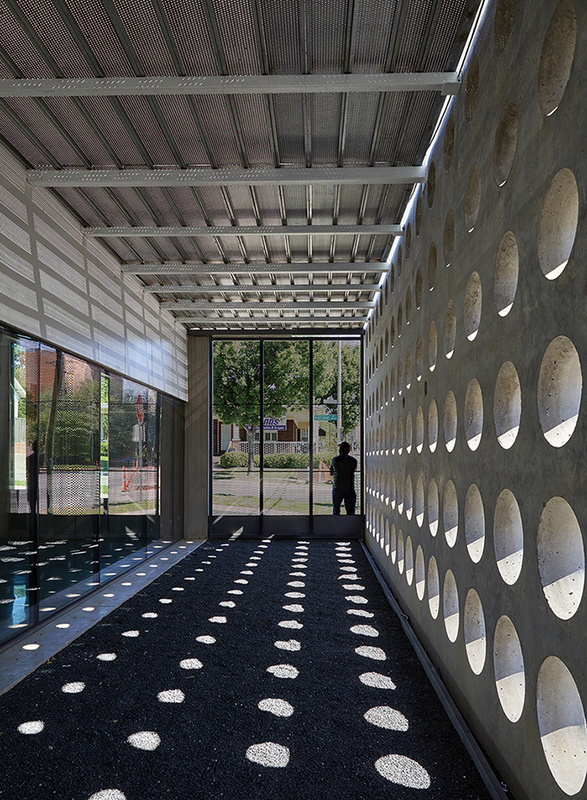 The hole pattern in the concrete screen wall depicts the graphic proportionality of seven standard apertures that restrict how much light is allowed to enter the camera. The openings in the wall are conically flared to increase the visual transparency and graphic presentation. The upper level walls and the aperture wall were poured on the ground and lifted into place, while the lower level walls were cast in place. The yellow box holds the children’s area. The relatively small site presented some challenges, as small sites often do. To overcome those challenges, the project team worked creatively to position temporary casting slabs while situating (and sizing) the crane so that all panels could be erected from a single point. Additionally, the project’s location greatly affected the architectural strategy. One of the primary influencers in the design of the project was a concern about security. Expanses of glass were seen as a major security issue, especially since the building is alongside a street. The initial designs for the project looked at putting the retail space on the lower level, opening up the building to the traffic on Montgomery; but the concerns of a potential smash-and-grab led to other ideas of how to design the project. The retail space was ultimately set on the second level, hovering over the street with a deck that overlooks the museum district beyond. 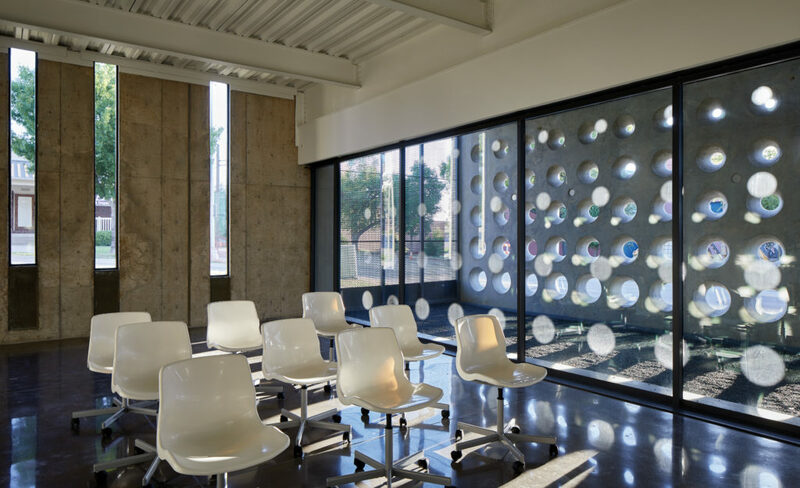 The Studio and Lounge were placed on the lower level with a small courtyard behind a concrete screen wall to protect their expansive glass walls. It was inevitable that this protective concrete wall was going to be the dominating face of the building. The design of the wall focused on two key attributes: identity and levity. How can we get this wall to not look so heavy from inside and out, and how can it showcase the building’s identity? After looking at several design iterations, the geometry of the holes ended up coming directly from an image the owner had sent the architect in the beginning stages of the project. It depicted seven standard aperture proportions, something identifiable and recognizable to the community of photographers who will be visiting the building. In studying the wall in the three dimensions, the architect discovered that flaring these “holes” allowed more transparency. The thickness of the wall is “hidden” by flaring the hole at a steeper angle than that of a standing viewer. This gives the impression from Montgomery Street that the wall is only inches thick, and it allows more light to penetrate through to the courtyard and interior spaces. 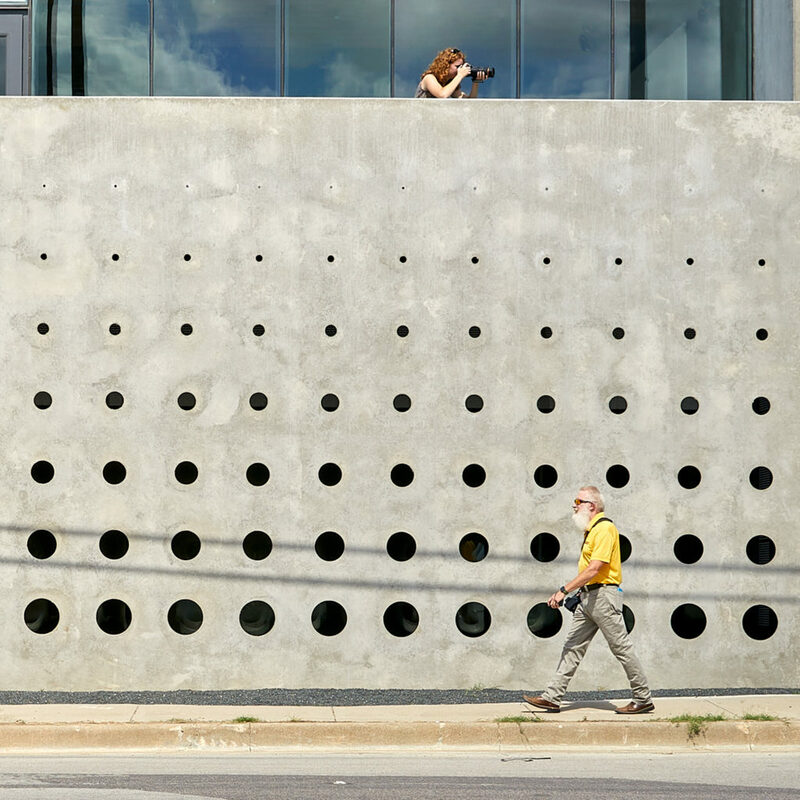 The aperture wall on Montgomery is 16 feet tall and 53 feet long, cast with 175 holes. The other tilt-wall panels used in this project are 30 to 40 feet long, and 21 feet tall. Casting beds were used to create enough casting surface for the required panels and to avoid any finish disturbance from the slab. The upper panels were set with a few inches of cantilever and a reveal joint to set them apart from the cast-in-place wall below. The aperture wall was cast on the upper part of the site, lifted by crane, and situated just a few feet off of Montgomery street. The wall has an array of 25 rows of 7 conical shapes. The forms for the conical holes were fiberglass molds that were vacuum-formed from milled-wood shapes. Each of the seven shapes were fashioned from solid laminated wood by Terry Pulliam, and subsequently vacuum-formed 25 times to make the 175 required forms for the wall. Because the cones were to be used with their small side down in the panel, foam was not an option, as it would have been disturbed too easily during construction. The heavy-duty fiberglass cones were secured by screws to the casting slab at their end and filled with sand to maintain their shape. They were topped with a shallow layer of grout to keep the sand from contaminating the surrounding concrete. The tilt-wall method allowed for great access to the conical forms, ensuring exact placement and proper consolidation of concrete. This would have been most difficult in a cast-in-place operation. The fiberglass forms and special attention from Pulliam Concrete created a beautiful, smooth finish on the concrete that carries from the exterior through the conical shapes. The finish on the panels is an unedited (no patching, rubbing, or paint) exhibition of the natural qualities of concrete. This naked presentation requires skilled craftsmanship, as deficiencies in accuracy and in quality stand out adversely, distracting from the expected variations of concrete’s materiality. The aperture wall holds a powerful presence on the street and has made the building somewhat of a landmark in the city. The wall became such an identity-forming element for Fort Worth Camera that they rebranded their company using the aperture wall graphic as a basis for their new logo, packaging, and corporate identity.